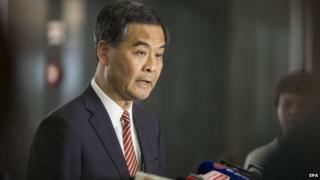 Mainland media back Hong Kong Chief Executive CY Leung as protesters step up their demands for his resignation. Hong Kong students angry at China's plan to vet candidates for 2017 polls say protesters will start occupying government buildings if Mr Leung does not resign by Thursday night. State media, however, dismiss the calls and praise the chief executive's performance. "The chief executive is chosen through a legal election process and appointed by the central government. The central government fully trusts Mr Leung, and is very satisfied with his work performance," says People's Daily. Criticising the protesters for disrupting social order and challenging the "law", the front-page commentary stresses that Beijing will not change its position on Hong Kong and will continue to back Mr Leung "for the sake of national security and interests, as well as for the interests of Hong Kong". "The central government will continue to give Chief Executive CY Leung its firm support to execute his policies in accordance to the law. The government will firmly support the police in dealing with the illegal activities in the city," states the article. In a separate report, the paper quotes several experts from think-tanks and universities in the mainland on Hong Kong affairs. The report says most experts agree that the protesters are hurting Hong Kong's interests and "they are not executing the freedom of expression in a normal way". Echoing similar views, an article in the China News Service slams the protesters for "bringing shame to the rule of law in Hong Kong". News portal China.com, in a commentary, accuses the US and UK of "inciting" the Occupy Central campaign "in order to mess up Hong Kong". "China is developing while the US and UK are on the decline, so they could only gather a minority of Hong Kongers who forgot their roots to create trouble for China. Such a scheme will definitely not succeed," says the article. Adopting a softer approach, the Shenzhen News website publishes an open letter from a high school student in Shenzhen, a southern China city bordering Hong Kong. "When I know that some students in Hong Kong are participating in the class boycott, and even taking to the streets, I cannot understand why. Being a student of your age, and being your neighbour, I have some heartfelt words to share," writes the "ordinary high school student" known as Si Yu. The letter, which has been reprinted on various websites, urges Hong Kong students to "go back to class, and to believe in the country". Ending the letter on an emotional note, the writer says that "we all have a home, its name is China… I deeply believe that when the country is good, Hong Kong will also be good". But some of China's main newspapers continue to ignore the protests. Outlets including the Beijing Times, Beijing News and Southern Metropolis make no mention of them. Instead, the papers have reprinted a Xinhua News Agency report noting that celebrations to mark the 1 October National Day attracted "large crowd of people in Hong Kong". Meanwhile in Hong Kong, papers remain divided. Pro-Beijing China Review News says the "mastermind of the protests" should be punished and cautions Hong Kong authorities to remain on high alert against "foreign forces" supporting the opposition. Calling for solidarity among the protesters, the editorial of the pro-democracy Apple Daily cautions "the people" to be "on high alert against the underhanded measures" of the chief executive. The article accuses Mr Leung of "pushing the blame of the chaos on the protesters and trying to reinforce his power". "He is not solving the problem, instead he is intensifying the conflicts, as preparation for clamping down the protests," says the article, urging protesters to "fight a long war" and not to lose the understanding and support of ordinary residents. Noting the silence from top officials, the South China Morning Post says the Beijing and Hong Kong governments "are playing a waiting game in hope Occupy will run out of steam". And finally, several Hong Kong celebrities have voiced their support for the protest. "What Hong Kong is going through now fills our hearts with pain. Most importantly, hope the students and residents are safe and sound. Hong Kong, add oil! [a form of cheer which means 'come on'! ]," singer Sammi Cheng writes on her Weibo, a Twitter-like service. According to audio uploaded on the Apple Daily's website, reputed actor Chow Yun Fat said he was "touched by the brave actions of the protesters and the residents", adding that the police "were wrong" to fire tear gas at students who were "rational".